Nursery wall letters are a popular and easy way to add some glamour to your baby nursery walls. They come in all shapes and sizes, from large to small, simple to elaborate, striped to dotted. No matter what your nursery design you can find nursery letters to match. Dimples and Dandelions has a great selection. And if you are feeling creative and you want to make your own nursery letters, you'll find lots of ideas on how to do that here too! The easiest way to add your own baby room wall letters is to paint them directly onto the wall. If you are feeling ambitious you can paint them free-hand and even incorporate them in a nursery border. If you are a little less adventurous you can simply use a stencil. Another easy option is to use nursery wall stickers. They come in many different colors and fonts. The wall in this picture was decorated using wall stickers. You could also cut out your own nursery letters from a variety of wall papers that complement your theme. Just stick them up using wall paper paste. You can make your own nursery letters using baby nursery wallpaper offcuts or decorative card stock in colors and patterns to match your nursery design. 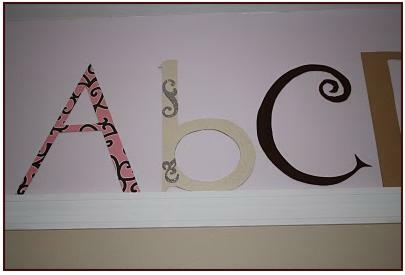 Find out how to make baby nursery wallpaper letters. If you want the classic hanging wall letters, you can make these yourself easily too. Buy plain wooden letters from your local hardware or craft store and paint them to match your baby nursery decor using acrylic paints. First give them a once over base coat, front and back, then add details such as polka dots or stripes in accent colors. You can add whatever ribbon or trimming you like for hanging them. The letters in this picture were hand painted by a mom who couldn't find baby room wall letters in the right colors to complement her nursery wall art. Another variation on this option is to cover the wooden letters with fabric or wall paper off cuts. These very effective nursery letters were created by covering basic wooden blocks with various patterned papers and then sticking painted wooden letters on top - simple. You could also cover the blocks with nursery fabrics. Framed nursery letters are easy to make and they make great nursery wall decor. Find a few inexpensive wooden frames and paint them using acrylic paints. Make a coordinating background for your letters using fabric, wall paper or card stock. Use your computer word processing program to print out letters in a font and size that you like. Trace these letters onto a selection of cardstock or fabric and cut them out. You can decorate them with acrylic paints if you don't want them plain. Stick these letters onto your background and frame! If you are good with a sewing machine you can sew letters from coordinating fabrics and stuff them. I hope you have found something you like or some inspirational ideas for making your own nursery wall letters on this page. For more ideas for nursery wall letters don't forget to browse through the baby rooms gallery! If you are looking for the widest range of nursery wall letters to choose from you must visit Dimplesanddandelions.com. They have the biggest selection on the web hands down - I have pictured a few above but they have over 340 different designs to choose from!